Our newest line of subwoofers are designed to provide wider installation options for a brange of vehicles. These "Shallow-Mount" Subwoofers feature multiple patent-pending features to deliver the big bass performance of a full-size subwoofer, but in a compact design that can be installed either behind or under seats depending on the type of vehicle. The mounting depth is just 3-1/4" - less than half a typical subwoofer in this class. 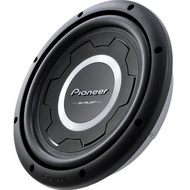 This 12" shallow subwoofer handles 1500 watts max., 400 watts nominal power, and delivers deep bass with top-notch sound quality thanks to features like Pioneer's extremely strong and lightweight Interlaced Basalt/Carbon Fiber Reinforced IMPP Cone. To ensure that you get more natural bass, we�ve incorporated out new Basalt fiber technology into our shallow subwoofers. The volcanic-rock fibers create a cone that is lightweight, rigid, well damped, stable in temperature extremes, and more environmentally friendly. In short, this bass really rocks.